More than 50 people, mostly women, completed the business training program. The sixth edition of the “Caguas Compite” business training program — an incubator and mentorship project for micro-entrepreneurs — closed with a total of 51 people trained, 12 businesses in operation, about 20 new jobs and $1.2 million in projected sales in the first year. 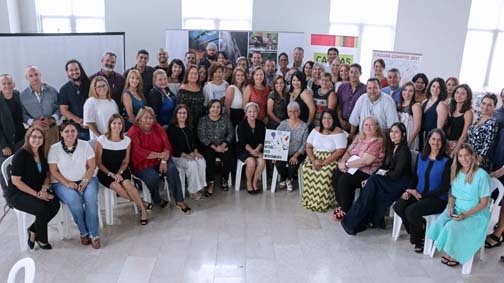 “Our Municipal Administration sees entrepreneurship as an alternative to self-employment and this program provides self-management tools to our citizens to be able to establish their micro and small enterprises, as well as train entrepreneurs in operation to carry your business to the next level,” Caguas Deputy Mayor Lydia Rivera-Denizard said. “Municipal investment in business training positively affects employment statistics and contributes to municipal finances through the granting of permits and payment of sales taxes and municipal taxes. In the long term, we are developing an entrepreneurial culture for the city, whose results we will see very quickly,” she said. This edition of “Caguas Compite” produced businesses focusing mostly on selling products and services. Among them are: Oceana Hub, a coworking space; Tu Norte Educativo, to provide education at home; El Viejo Almacén, a cafe-theater; a second-hand boutique; a gourmet chocolate factory; and children’s literature writer. The Caguas Compite program is funded with Community Development Block Grant and municipal funds. It focuses on two areas of service or needs: entrepreneurs with business ideas but with no previous experience, and established companies that need to be rethought, grow, expand or export. As part of the Social Entrepreneurship Program, the need was identified for mentoring and individual support, as well as the need to create an integrated training that addresses not only the business training, but the understanding of what being an entrepreneur is all about. A comprehensive program was designed that covers training from Puerto Rico’s economic reality, a personal analysis of the reality of the family environment, and the business training needed along with tools that enable its execution. Consultants provide assistance during the process of studying and establishing a viable business, town officials said. The two-pronged program consists of “Caguas Compite 1,” which offers entrepreneurial training for people who have business ideas but have no administrative or commercial experience. They are able to discover the viability of their business ideas, or modify their ideas to make them viable. The program incorporates those businesses into the formal economy. “Caguas Compite 2” offers training for entrepreneurs to take their business to another level of competition. The program aims to sensitize the businessperson to achieve another vision of doing business and offers them tools to rethink their business. This training offers 16 non-traditional business training workshops, five group mentoring encounters, and individualized mentoring according to need and application. “In Caguas we have strengthened the business ecosystem to create native companies and develop job opportunities within a framework of global competitiveness, sustainability and solidarity economy,” the deputy mayor said. “Our city is one of opportunity and we work to make it the best place to do business in the island. In addition to business training, PromoCaguas offers individualized and specialized mentoring to meet the unique needs of each case, from starting the business to expanding its operations and export support,” she said. Hey Buddy!, I found this information for you: "‘Caguas Compite’ graduates 51 new entrepreneurs". Here is the website link: https://newsismybusiness.com/compite-graduates-entrepreneurs/. Thank you.